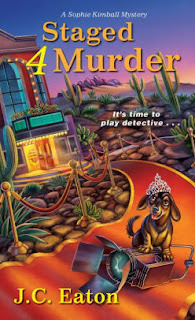 The Sophie Kimball Mysteries are on a roll! Ditched 4 Murder is set for its release date on November 28, 2017! There's nothing like a 74 year-old bridezilla and a murder or two! Look for it on Amazon, Barnes & Noble and your favorite bookstore. Also Kindle & Nook. Staged 4 Murder is set for release June 26, 2018. Join the fun when the Sun City West book club ladies try out for a murder mystery play and wind up dealing with the real thing! Not to mention a ghost haunting the theater!